Statistics can be a valuable tool with the ability to summarize, explain and show trends in data. But at the same time, just like other quantitative tools, statistics can be misleading. Even statistics that are technically accurate may prove misleading, since underlying facts are not presented. The problem with misleading statistic is that it may contribute to inaccurate knowledge. For example, the compilation of transnational waste statistics commonly present how some countries successfully manage their waste through circular flows of recycling, while other countries with an outdated waste management, based on linear flows, seem to landfill almost all of their waste. An example of this is the European Union’s compilation of its member states waste statistics. The latest report was prompted by a press release from Environment Commissioner Janez Potocnik who stated that “Waste is too valuable to just throw away … Six member states now combine virtually zero landfilling and high recycling rates” while other countries in the EU are reported to deposit more than 75% of their waste (European commission, 2012). Treatment of municipal solid waste in EU27 (2008). Used with permission from Profu. A comparison of national waste statistics shows undeniable differences between countries. However, such statistics are in many ways misleading and highlights differences that may actually not be there. In fact, many of the countries that seem to have circular waste flows landfill the majority of their waste on closer inspection. European countries with low rates of landfilling have commonly replaced disposal with incineration, as seen in the figure above. What is not shown in the waste statistics, however, is that after the incineration process, 20-25% of the waste remains in the form of ash, which is deposited forming moon landscapes of ashes. Material recycling of, for example metals, is not completely effective which leads to substantial amounts of residue sent to deposition. Furthermore, a significant share of waste sent to incineration as well as material recycling is rejected due to quality concerns and ends up in landfills. But above all, waste statistics is commonly restricted to household waste, although this fraction only covers a small percentage of the total waste generated (cf. MacBride, 2012). For example, in Sweden, the households account for less than 5% of all waste generated. The rest comes from the industry. In Sweden, 80% of all waste derives from mining activities and all is more or less sent to deposition (SEPA, 2012). 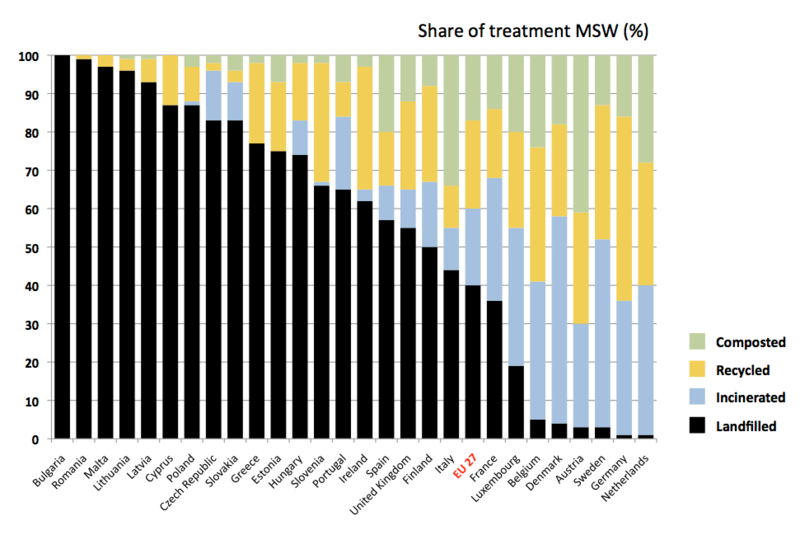 Although Sweden has a relatively large mining sector compared to other countries, the proportion of deposition generally increases if all forms of waste and its actual end station are included. By focusing on where the waste actually ends up, countries on the other side of the spectrum with seemingly linear disposal systems may simultaneously prove to be circular with significant shares of waste being recycled. In many of these countries, waste is an informal livelihood for people. There are several reports (e.g. Wilson et al., 2006; Scheinberg et al., 2010) demonstrating how countries lacking formal recycling systems instead have self-organized informal recycling systems with high efficiency. One of these countries is Bulgaria, threatened with non-compliance fines from the EU as almost 100% of all waste is estimated to end up in landfills. But this official statistics ignores the work of the informal sector. For example, in the city of Varna the informal sector recycles 26% of all municipal waste by picking up waste from containers as well as from landfills (Scheinberg, 2012). Below the radar of formality, waste management has many layers, which are difficult to capture in waste statistics. Therefore, waste statistics should be used only with caution as an indicator for the waste situation and basis for further polices. European commission, 2012. Environment: Getting gold from garbage – how some Member States are making waste a resource. Press release: IP/12/369. MacBride, A. 2012. Recycling Reconsidered. The Present Failure and Future Promise of Environmental Action in the United States. MIT Press: Cambridge, MA. SEPA, 2012. Avfall I Sverige 2010/Waste in Sweden 2010. The Swedish Environmental Protection Agency. CM Gruppen AB; Bromma. Scheinberg A, Wilson D.C., Rodic-Wiersma, L., 2010. Solid Waste Management in the World’s Cities: Water and Sanitation in the World’s Cities 2010. UN-HABITAT/Earthscan, London, UK. Scheinberg, A. 2012. Informal Sector Integration and High Performance Recycling: Evidence from 20 Cities. WIEGO Working Paper No. 23. Wilson, D. C., Velis, C., Cheeseman, C., 2006. Role of informal sector recycling in waste management in developing countries. Habitat international 30(4): 797-808. San Francisco’s Famous 80% Waste Diversion Rate: Anatomy of an Exemplar, by Samantha MacBride, 12/06/2013. This entry was posted in Economics/Economies, Methods, Recycling, World and tagged waste statistics. Bookmark the permalink.